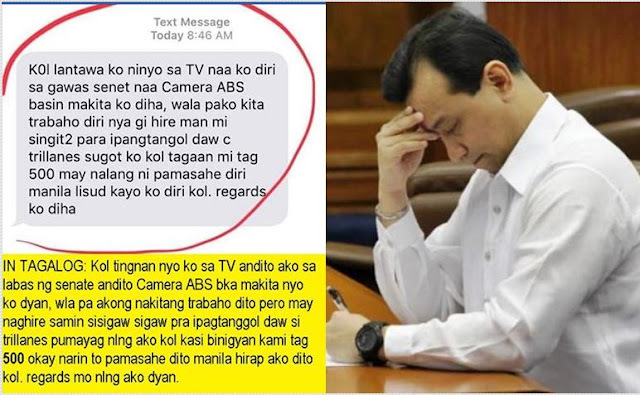 A concerned netizen took to social media as he revealed the alleged proof showing that some supporters of Senator Antonio Trillanes who are now outside the Senate premises were being paid as supporters of the senator. According to concerned netizen Tot So, he has some evidence showing that the Trillanes supporters were indeed paid with P500.00 to support the senator who is now staying at the Philippine Senate because of the possibility of being arrested after Trillanes amnesty was declared null and void by the President. 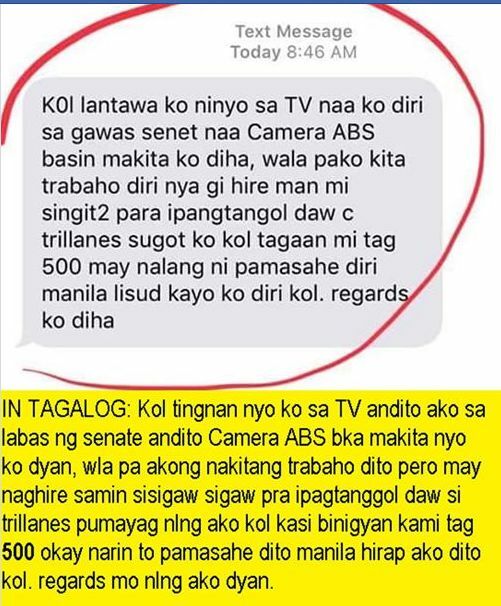 "KOl lantawa ko ninyo sa TV naa ko diri sa gawas senet naa Camera ABS basin makita ko diha, wala pako kita trabaho diri nya gi hire man mi singit2 para ipagtangol daw c trillanes sugot ko kol tagaan mi tag 500 may nalan ni pamasahe diri manila lisud kayo ko diri kol. regards ko diha." The text message was translated to Tagalog which says "Kol tingnan nyo ko sa TV andito ako sa labas ng senate andito Camera ABS baka makita nyo ko dyan, wala pa akong nakitatrabaho dito pero may naghire samin sisigaw sigaw pra ipagtanggol daw si trillanes pumayag nlng ako kol binigyan kami tag 500 ok narin to pamasahe dito manila hirap ako dito kol. regards mo nlang ako dyan." the message read. Based upon the statement of the message sender as an unemployed individual having a difficult time in Manila being hired as one of the supporters of Trillanes outside the senate is indeed a blessings because of the hardships he/she encountered in Manila.